There are many ways to donate and many ways to acknowledge that donation. A donation can be a one-time act or a recurring gift. Your act of kindness can do good for years to come. Click here to review several different kinds of donations. You must have PDF Viewer to view and print the donation. Click here to download free PDF reader. Your financial donation can mean so much to so many. And every dollar will be well spent. Over 90 cents out of every dollar is used directly for assisting lung transplant recipients and their families. 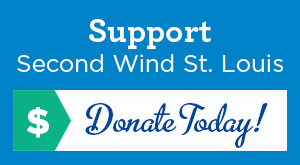 If you would like to make a donation to Second Wind St. Louis, please fill out the following. Your generosity is deeply appreciated. Unrestricted Donation. Any Second Wind St. Louis need. Assistance Fund. This fund provides limited financial assistance for lung transplant patients to help with emergency needs, lodging or many of the other associated costs in the transplant process. Lung Walk Sponsor. Please contact Ken Schanz by calling 618-974-3971 or via email to learn more about sponsorship levels. Would you like us to send an acknowledgement card to the family? Please only hit ’Submit’ only once. It may take a few moments to process. All information obtained by Second Wind is private and confidential and will not be given to any other party. If you have donation questions, or any other questions pertaining to Second Wind, please contact Ken Schanz by calling 618-974-3971 or via email.